Italy on Saturday signed a "non-binding" protocol with China to take part in Beijing's new "Silk Road" of transport and trade links stretching from Asia to Europe. Also signing the accords were the chairman of China's chairman of the National Development Commission He Lifeng and Italian deputy prime minister and Minister of Economic Development Luigi Di Maio. 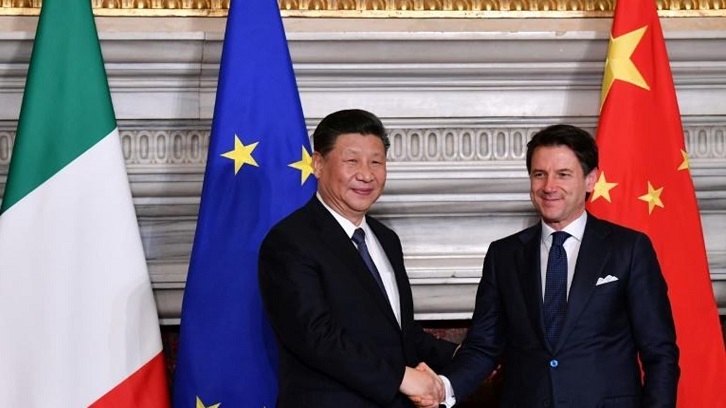 Italy has rolled out the red carpet for Xi, who Friday sought to allay Western unease over his transformational infrastructure initiative by emphasising the $1 trillion project's mutual benefits. The accords also foresee the opening up of the Chinese market for Italian oranges as well as a partnership for Chinese tourism giant Ctrip, notably with Rome's airports. Cultural tie-ups including town twinnings are also on the agenda while Beijing is pushing to have several Serie A football matches played in China -- although that would currently contravene regulations of the game's governing body FIFA. "We are well aware, with this memorandum of understanding, that there is risk as well as opportunity," said secretary of state for the economy Michele Geraci, who spent a decade working in China. Critics say Beijing's ambitious maritime, rail and road venture is "predatory" and overwhelmingly favours China and Chinese companies. Mattarella responded that business must go "in both directions... with fair competition, respecting intellectual property rights while fighting counterfeit goods". In what some perceived as a snub, Italy's far-right Deputy Prime Minister Matteo Salvini did not attend Friday's state dinner for Xi at Mattarella's Quirinal Palace, having stated that Italy would be "no-one's colony." Salvini has notably urged caution about using Chinese telecom giant Huawei's next generation 5G mobile technology, whereas coalition partner Luigi Di Maio is keener for Chinese partnerships.